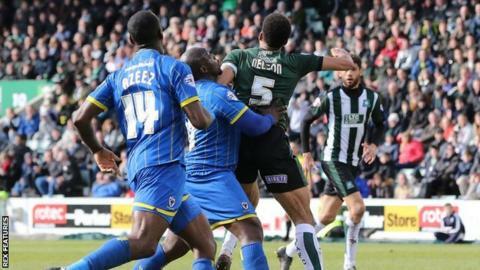 Adebayo Akinfenwa struck his first goal in over four months to earn a late victory for AFC Wimbledon at League Two promotion rivals Plymouth. Wimbledon led from a lightning break on 30 minutes when Tom Elliott and Jake Reeves set up Lyle Taylor to score. Graham Carey belted home a brilliant 61st-minute angled volley from left-back Gary Sawyer's cross to level. But Akinfenwa beat Curtis Nelson to a high ball on the edge of the box to somehow loop home the winning header. Plymouth drop a place to fifth, three points off an automatic promotion place. Wimbledon climb into the last of the play-off places in seventh, nine points behind Argyle. "I put that down as probably the toughest game we've had. They played a diamond, that was tough to play against, they haven't played that recently. "The first half was really tough so to come in 1-0 up was a really gritty performance. "Obviously when they scored the onus was on them to go and win it and the momentum was with them. "Ade has come on and no-one else would probably have the strength to hold the man off and power a header from that distance." Match ends, Plymouth Argyle 1, AFC Wimbledon 2. Second Half ends, Plymouth Argyle 1, AFC Wimbledon 2. Goal! Plymouth Argyle 1, AFC Wimbledon 2. Adebayo Akinfenwa (AFC Wimbledon) header from the centre of the box to the bottom left corner. Corner, Plymouth Argyle. Conceded by Jake Reeves. Substitution, Plymouth Argyle. Craig Tanner replaces Hiram Boateng. Attempt missed. Hiram Boateng (Plymouth Argyle) left footed shot from outside the box is too high. Corner, Plymouth Argyle. Conceded by Dannie Bulman. Attempt missed. Adebayo Azeez (AFC Wimbledon) right footed shot from the left side of the box misses to the right. Attempt missed. Peter Hartley (Plymouth Argyle) header from the centre of the box is close, but misses to the right. Substitution, Plymouth Argyle. Kelvin Mellor replaces Jordan Forster. Jake Reeves (AFC Wimbledon) wins a free kick in the attacking half. Attempt blocked. Adebayo Azeez (AFC Wimbledon) right footed shot from the centre of the box is blocked. Tom Elliott (AFC Wimbledon) wins a free kick on the left wing. Attempt missed. Curtis Nelson (Plymouth Argyle) right footed shot from outside the box misses to the right. Corner, AFC Wimbledon. Conceded by Jordan Forster. Substitution, Plymouth Argyle. Gregg Wylde replaces Jordan Houghton. Goal! Plymouth Argyle 1, AFC Wimbledon 1. Graham Carey (Plymouth Argyle) left footed shot from the right side of the box to the bottom left corner. Assisted by Gary Sawyer. Attempt missed. Jake Jervis (Plymouth Argyle) right footed shot from outside the box is close, but misses to the left. Attempt saved. Lyle Taylor (AFC Wimbledon) right footed shot from the centre of the box is saved in the centre of the goal. Attempt missed. George Francomb (AFC Wimbledon) left footed shot from the right side of the box misses to the left. Attempt saved. Hiram Boateng (Plymouth Argyle) left footed shot from the left side of the box is saved in the top right corner. Second Half begins Plymouth Argyle 0, AFC Wimbledon 1.